This sweet figurine in natural obsidian is always on the lookout for romance and love. Radiant and graceful, it has its own stylish way to bring harmony, romance and glamour on stage. 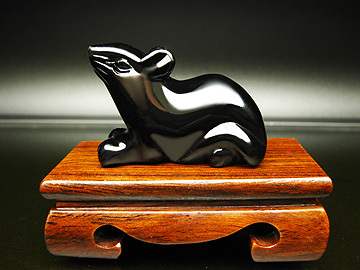 Rainbow obsidian (black) represents water element and is therefore best to synchronize with the rat's water element. It is especially recommended to activate the Tao Hua Love Luck for those born under zodiacs rabbit, sheep and pig according to the lunar calendar. Rats are often associate to smartness and intelligence. They are fabulously street smart and recognized for their survivability. Its place is best in the north, and when it is place in this direction, it will also bring much career luck as well. What Rat symbolizes and how to place the object? Traditionally, rat is associated to intelligence, street smartness and fertility. Chinese associate rats to symbolize good luck associated to fast money. The presence of rats activate career luck and income luck. Display the rat to activate Tao Hua Love Luck for singles (those born under zodiacs rabbit, sheep and pig) who are seeking relationship and marriage luck, place this figurine in the north of your bedroom, north quarter of your house, north of your living room and even north sector of your workdesk.